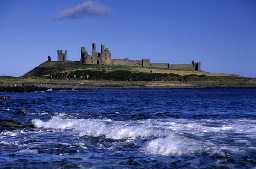 Dunstanburgh Castle. Photo by Andy Brown, 2003. 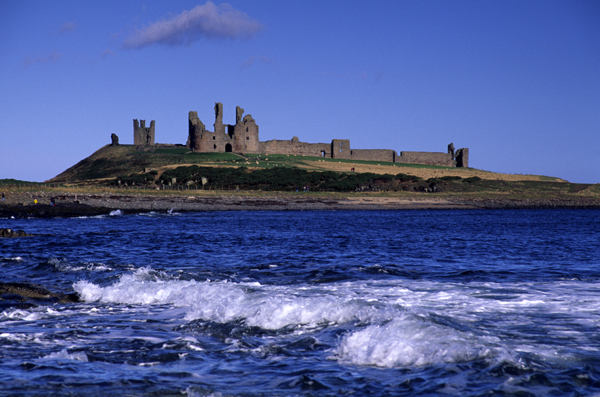 Dunstanburgh Castle is a 14th century enclosure castle standing in a dramatic position on an isolated promontory overlooking the North Sea. The walls and gatehouse were built between 1313 and 1316. 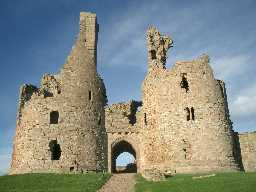 The castle was enlarged in the later 14th century when the gatehouse was turned into a keep and a new gateway was built. In 1382-3 an inner ward was created behind the keep by a range of buildings placed around a courtyard. These buildings included accommodation for guests and men-at-arms as well as a kitchen and bakehouse. The inner ward lies within a much larger enclosure which was surrounded by stone curtain walls; the northern side has been damaged by the sea as long ago as 1543, but the other sides are still upstanding. A number of towers are built in the curtain wall; Lilburn Tower and Egyncleugh Tower were built in the early 14th century, whereas Constable Tower was built later that century. Inside the enclosure are the remains of the castle's home farm. South of the castle, near the inlet called Nova Scotia, is the site of the castle's harbour. In 1314, a ditch was dug from here around the western side of the castle towards Embleton Bay in an attempt to make the promontory into an island. The ditch can still be seen, measuring about 4m deep by 24m wide, and was crossed by a drawbridge in medieval times. Around the castle are remains of post-medieval ridge and furrow cultivation, a range of buildings thought to be an outwork commanding the approach to the castle. The castle was built Thomas Earl of Lancaster, High Steward of England during the reign of Edward II and seems to have been built as a bolt-hole for Lancaster rather than for strategic reasons. After Lancaster's execution in 1322, the castle was eventually returned to his heirs in 1326 and came to John of Gaunt in the 1330s. It became a royal castle governed by constables at the end of the 14th century when, in 1399, John of Gaunt's son, Henry Bolingbroke, took the throne from Richard II to become king Henry IV. The castle is believed to stand on the site of an earlier Romano-British settlement. The castle is owned by The National Trust and in the guardianship of English Heritage. This is a Scheduled Monument and Grade I Listed Building protected by law.